Owning a small business is gratifying as long as we make ends meet at the end of the month. When the sales don’t seem to be enough, we look for ways to let the public know that our services or products exist, and they should give it a try. If you’re already in the marketing phase of your site, you might have already heard about Search Engine Optimization and Search Engine Marketing. Both have the same number of initials (they use keywords) and purpose, to maximize traffic on a webpage and earn from it. SEO works by link building, optimization activities such as writing and updating reliable content, including the use of metadata, keywords, and tags. The web can offer us a lot of ideas and guidelines in making SEO easy for us even though it can still be quite confusing. And if we get it right, we’ll be able to collect organic search results without paying a cent. On the other hand, SEM involves paying for advertisements and clicks (can be referred as Pay-Per-Click or PPC.) This is a good alternative for small businesses who want more traffic than what a simple SEO can do. This is also the best option if your business is seriously competing with another in a local search result. In a short period of time, you might get your investment back. With its difference, you’re probably thinking that only one of them is necessary and the other will only cost you money. There’s no denying that free is better, but in today’s growing competition in earning the top spot of a Search Engine Results Page (SERP), combining the two methods might just give you the results you’ve been looking for. We’re not claiming that SEO alone will never help your site earn a lot of traffic because there’s no way we should underestimate organic searches. 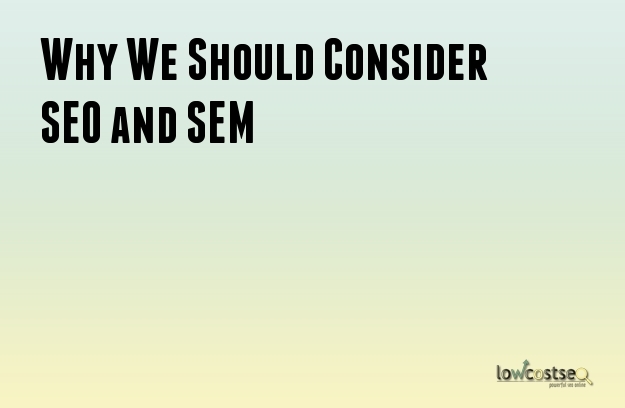 SEO and SEM both aim for better search results. By maximizing the effort, we maximize the outcome. When running two methods together, they end up sharing keyword data which helps your team identify keywords that are helpful and harmful for your site. Choosing the perfect PPC and organic keywords can be the foundation of your optimization methods. Plus, it helps your site appear more often on SERPs, making it easy for users to trust your site’s credentials. While giving SEO more time it needs to work its magic, SEM can provide advertising campaigns quickly. Learn more about Google AdWords, Yahoo Search Ads, and Bing Ads to help you with your paid searches. These search engine sites provide helpful tips for beginners. Sometimes, no matter how good a content is if it has a lot of similarities with others, it gets unnoticed. And so, we go back to visibility. This blog or articles can still be viewed by many if it is promoted through SEM. With the help of your impressed viewers, a word can be spread through social media sharing.